By Louis Jacobson on Sunday, September 30th, 2018 at 10:00 a.m. Updated Oct. 29, 2018, with campaign finance data through mid-October. In our politically polarized era, few issues are as polarized as gun policy. The most recent mass shooting at a Pittsburgh synagogue is latest in a deadly list. From mass shootings like the one of concertgoers in Las Vegas, to school shootings like the one in Parkland, Fla., to police shootings, gun violence has driven passions on both sides, both among Americans who say too many guns make everyone unsafe and among critics who say that only gun ownership can assure an individual’s safety. As part of our effort to analyze key issues in the 2018 midterm elections through a handful of graphics, here are some of the factors shaping the gun policy debate today. How many guns are being produced? Guns are popular — and big business. Since 1997, total firearm production has more than tripled, with significant increases in both pistols and rifles. And to the extent that these firearms remain in the United States, they join an uncounted but large reservoir of guns manufactured in previous years. According to the National Shooting Sports Foundation, the gun industry directly employs 141,500 people, and when supplies and indirect employment impact is added in, the number reaches more than 300,000. Do more guns mean more shootings? It depends. When making comparisons in gun violence between the United States and other countries, you can get different results depending on the category of country you’re looking at. The rate of violent gun deaths in the United States isn’t close to No. 1 internationally. The chart above shows the top 10 countries measured by violent gun death rate in 2016, according to the Institute for Health Metrics and Evaluation. Many countries in the western hemisphere have far higher rates of violent gun deaths than the United States does, including such populous countries as Venezuela, Colombia and Brazil. But if you compare the United States to the other advanced industrialized nations, its gun death rate is far higher. The chart above shows that the United States firearm homicide rate is seven times higher than the closest rivals (Canada and Portugal), and its firearm suicide death rate is almost twice as high as the next-closest country (Finland). In the political money game, the pro-gun side has long been dominant. The chart above shows outside spending by pro-gun groups (in red) and pro-gun-control groups (in blue), compiled by the Center for Responsive Politics. Outside spending refers to political expenditures made by groups or individuals independently of, and not coordinated with, candidates' committees. This can include so-called super PACs and "dark money" groups. From 2004 to 2016, pro-gun groups -- including the biggest, the National Rifle Association -- have had a lopsided advantage. In the 2016 election cycle, the difference was $19 in gun-rights spending for every dollar spent by gun-control groups. That appear to be changing, however. To this point in the 2018 campaign cycle, gun-control groups have actually slightly outspent pro-gun groups. For instance, Giffords PAC -- named after former U.S. Rep. Gabby Giffords, who was wounded by a shooter at a constituent gathering -- has spent $5,845,856 in outside money so far in the 2018 cycle, while Everytown for Gun Safety Action Fund has spent $3,873,052 over the same period. As for direct contributions to candidates, the pattern has begun to switch as well. 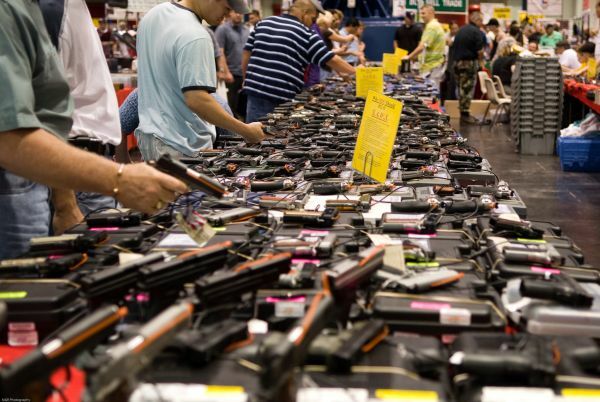 Pro-gun donations to candidates have long dwarfed donations by gun-control groups. However, gun-control groups’ giving has accelerated since the 2014 campaign cycle. So far in 2018, gun-rights groups are donating more than gun-control groups are, but the gap is much narrower than in years past. Public support for stricter gun laws has been on something of an upswing. Data from Gallup — over 18 years and using the same question — shows that support for stricter gun laws has risen from 47 percent in October 2014 to 61 percent in October 2018. That’s the highest it’s been in almost two decades. PolitiFact has tracked a number of claims about guns this year. See them all. • Arguing against gun control, NRA president Oliver North said of young shooters that "many of these young boys have been on Ritalin since they were in kindergarten." False. A minor percentage of school shooters studied had been medicated, not "many." The notion that many have specifically been on the drug Ritalin since kindergarten has no factual basis. More broadly, causation has never been established between the medication and violence. We found no specific ties between ADHD medication and school shootings, either. • On the other side of the divide, Moms Demand Action founder Shannon Watts said the call by some conservatives to train and arm teachers in schools to use weapons would not be a good idea. "Trained police hit their targets less than 30 percent of the time," she said. Half True. A national figure for police marksmanship is not readily available. Overall, data from some jurisdictions supports Watts’ claim, while other data refutes it. • New York Gov. Andrew Cuomo, a Democrat, said his state passed the toughest gun law in the nation, referring to the Secure Ammunition and Firearms Enforcement Act passed after the Sandy Hook school massacre. That rates Mostly False. While the Giffords Law Center to Prevent Gun Violence agrees with him, several other states consistently rank higher than New York for toughness when their individual laws are taken together. In the Brady Campaign to Prevent Gun Violence’s most recent evaluation of the "strongest" state laws, New York came in fifth, after California, Connecticut, Massachusetts and New Jersey. • Because the issue of guns is so divisive, it is fertile ground for online misinformation. No, the United States is not third for murders in the world as a result of a few cities. No, Pope Francis didn’t really say that gun owners can’t call themselves Christians — nor did he call for worldwide gun confiscation except for the United Nations. Bureau of Alcohol, Tobacco, Firearms and Explosives, "Firearms Commerce in the United States Annual Statistical Update, 2018"